I love the kitchen units. - Could you please let know which company supplied them? Thank you. I’m in awe! did you make the worktops yourselves? The kitchen units are bespoke, with all the doors and panels made by Stephen’s carpenter, Gregos. “It’s quite a minimal design, with very narrow beading around the edge, and handles the same size as the trim,” Stephen says. 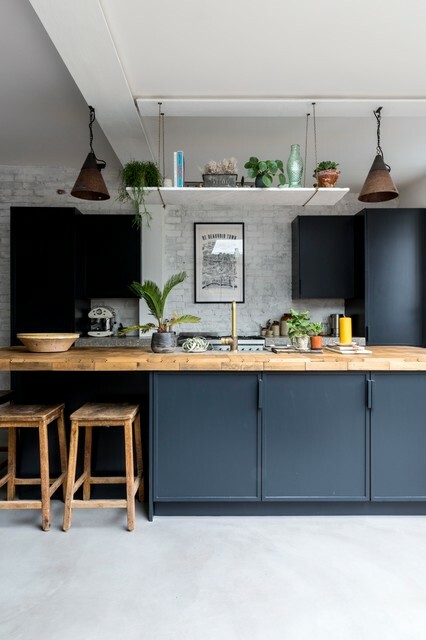 “The exposed brick and steel supports elsewhere are quite busy, so this offers a nice balance.”Units painted in Black Blue, Farrow & Ball. Same color scheme – just swapped white/wood. White floor and wood countertops. I will have wood floors and white countertops. This is my color palet.